By Melissa Leave a Comment - The content of this website often contains affiliate links and I may be compensated if you buy through those links (at no cost to you!). Learn more about how we make money. Last edited September 8, 2014 . My husband and I just bought a 17 year old house. We were told on the inspection that the air conditioning unit was original to the house and would likely go out some time sooner rather than later. To protect us, the realtor added in a clause that the seller would pay for a one year home warranty. The realtor's advice was that I not let the policy lapse, especially knowing that a $5,000 to $6,000 air conditioning replacement will likely occur in the next few years. Of course, having a home warranty policy when someone else pays for it is a no-brainer. Why not? Yet, should we pay $500 ourselves next year when the warranty needs to be renewed? In our case, we've decided that yes we should. We moved into our house on Thursday, and by the next Thursday, my husband discovered that there was water pooled around the bottom of our hot water heater and that the carpet around it was soaked through. I discovered that the adjoining wall had water damage. Welcome to home ownership! We called the warranty company, and in the end, they paid $325 for labor plus the cost of the water heater. We had to pay $303 out of pocket. In one week, the warranty paid for itself. 1. How old is your house? If you're buying a brand new house, you may not need a warranty. Likely it will be several years before anything major breaks down. Instead of paying for a warranty, you can put the money you would have spent into savings so when something goes wrong, you'll have quite a bit set aside. 2. Are there any major appliances that will likely need to be replaced soon? Depending on the appliance, if the expense will cost more than the cost of the warranty for the year, a warranty will likely be worthwhile. 3. How large is your emergency fund? If you have a large emergency fund, you may not need to buy a warranty, especially if you can cover the repairs. However, many first time home buyers exhaust most of their savings buying their homes. When money is tight, a home warranty can be a good idea. I thought with our home warranty, we'd just need to pay the $60 service fee and the warranty would cover the rest. That was not the case. Some parts outside of the hot water heater had to be replaced such as the hoses connected to the water heater as well as the water handle. The warranty did not cover those parts nor the labor to install them, which is why we had to pay a total of $303 out of pocket. Bob Schacke, a home inspector in Chicago, recommends reading a warranty's fine print, because some warranties won't cover old appliances. At that point, it's ‘buyer beware'” (MSN Real Estate). There were two major reasons why we decided to keep the warranty next year. First, it's already paid for itself in our first week of home ownership. Who knows when the air conditioning unit will go. Second, we only plan to stay in our house for roughly five years. I don't want to invest a lot out of pocket on repairs and appliance replacement knowing that this is very likely not our “forever” house. What are your thoughts? 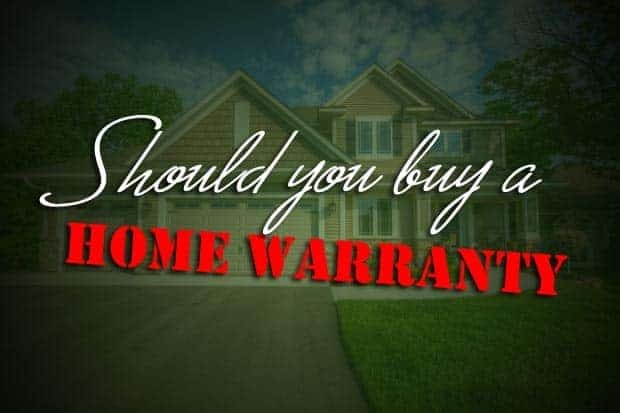 Have you bought a home warranty? Would you recommend one? Last Edited: 8th September 2014 The content of biblemoneymatters.com is for general information purposes only and does not constitute professional advice. Visitors to biblemoneymatters.com should not act upon the content or information without first seeking appropriate professional advice. In accordance with the latest FTC guidelines, we declare that we have a financial relationship with every company mentioned on this site.